Happy Friday y'all and even more important today- Merry Christmas Eve Eve!! 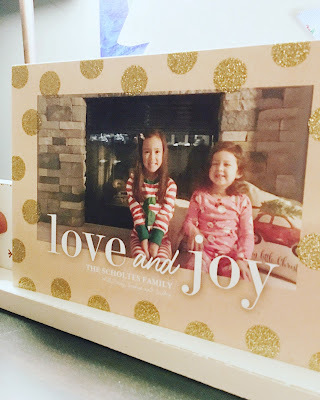 We are so excited for Christmas at our house and we're just brimming with excitement! We can't wait for a long weekend and lots of time with all of our favorite people!! I thought I'd share our Christmas card today- it's simple, a little blurry and you know what? It might just be my favorite card yet! I didn't stress about the photo this year, instead I shot the girls in front of our fireplace in their Christmas jammies. I'll be back next Tuesday sharing all about our Christmas. I hope you all have a very merry holiday. For some of you, I know the holidays can be a hard time of the year, so my heart is with you as well.